The National Weather Service (NWS) in Springfield says severe weather is possible Friday night into early Saturday morning in far southwest Missouri, primarily along the I-49 corridor. NWS meteorologist Doug Cramer says hail and damaging winds are possible. 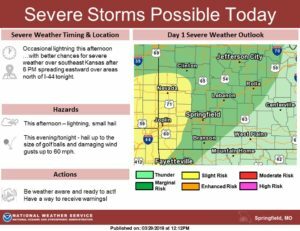 “We do have still a slight risk for some severe thunderstorms in southeast Kansas and then areas along the Interstate 49 corridor from about Nevada down to Joplin,” Cramer says. Lamar is also in the “slight risk” category area. Cramer says quarter-size hail and damaging winds are possible. He also urges motorists to be cautious near low water crossing areas this weekend. “Whenever we get these types of systems if we can get some localized rainfall, they’ll be a risk for, you know, some low water crossing flooding, so anybody traveling this evening may want to just kind of be a little bit cautious,” Cramer tells Missourinet. Meantime, the NWS in St. Louis is warning that another two inches of rain is expected by Saturday morning for mid-Missouri’s Jefferson City, Columbia, Sedalia and Lake of the Ozarks. 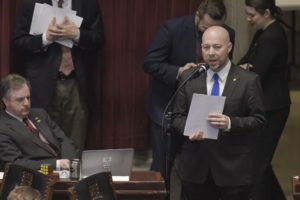 The Missouri House voted Thursday in Jefferson City to approve a $29.2 billion state operating budget, which includes a $100 million transportation infrastructure plan. House Budget Committee Chairman Cody Smith, R-Carthage, tells House colleagues it’s the first time in recent history that general revenue would be used to fund roads and bridges. “This is not in place of those dedicated road funds, this is not in place of the system of the road fund that we have where the gas taxes and fees and everything dedicated to funds go into that road fund,” Smith says. Smith says his $100 million plan does not raise taxes or incur new debt. He says the state Department of Transportation (MoDOT) has paid more than $700 million in debt payments in the past two years. Meantime, Senate President Pro Tem Dave Schatz, R-Sullivan, tells Missourinet Governor Mike Parson’s proposed $350 million bridge bonding plan is still alive in the Senate, adding that discussions are ongoing. Governor Parson’s bonding plan is aimed at repairing or replacing 250 deteriorating bridges. 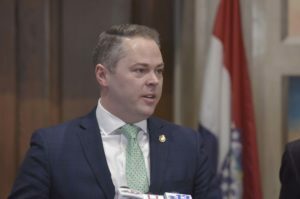 As for the House, Chairman Smith has expressed concerns with the governor’s plan because of debt, noting that MoDOT’s five-year average debt payment is $313 million per year. Governor Parson spoke Thursday at an MU Extension event in Columbia, and spoke to our sister network Brownfield about the House plan. Parson says the $100 million plan is not enough. “No I don’t think it is, it’s not and I’m not sure that obligation to do, you know the plan that we put out there was for $350 million, and I think to really have an impact that’s what you have to look at,” Parson tells Brownfield. Interstate 49 runs right through Smith’s southwest Missouri district, which has a strong transportation presence. Smith also tells House colleagues he opposes placing another gasoline tax increase on the ballot. Missourians rejected a proposed ten-cent gasoline tax increase in November. Missouri’s 17-cent gasoline tax has remained the same since 1996. Meantime, the House’s $29.2 billion budget includes an $8 million retention pay plan aimed at investing in wage increases in Missouri Department of Corrections (DOC) staff. Chairman Smith praised the plan Thursday on the House floor. Governor Parson says the DOC has 11,000 positions, making it the state’s largest agency. The governor says DOC employees are among the nation’s lowest-paid corrections professionals. The vice chairman of the Missouri House Corrections and Public Institutions Committee is also praising the retention pay plan. State Rep. Jim Hansen, R-Frankford, tells colleagues the plan will improve DOC employee retention. “I think most of you in here (the House chamber) know that they’re the lowest paid probably in the United States. We’ve had several issues that we’ve dealt with in the Department of Corrections and have made major changes with the new director (Anne Precythe) who’s done such a great job,” says Hansen. State Rep. Kip Kendrick, D-Columbia, the House Budget Committee’s ranking Democrat, says some Missouri corrections officers have moved to Iowa for better pay there. Under the budget approved by the House, DOC employees would receive the three percent pay increase all state workers would get. They would also receive a one percent increase for every two years of continuous DOC employment, up to 20 years. The House’s budget also supports the governor’s plan to consolidate two prisons in northwest Missouri’s Cameron, which is aimed at improving employee retention. A veteran award-winning newsman who was the longtime radio voice of the Mizzou football Tigers will be inducted into the St. Louis Media Hall of Fame Saturday evening. Saturday’s gala begins at 6:45 p.m. at the Red Lion Hotel on South 14th Street in St. Louis. The ceremony is open to the public. Bill Wilkerson, who died in 2017 at the age of 72, handled the Mizzou football play-by-play duties from 1982 to 1993, according to Learfield-IMG College executive producer Keith Sampson. Wilkerson’s analyst for the 1989 and 1990 seasons was former Mizzou basketball star Tom Dore, who says Wilkerson was the best. “This is just one of those guys that lived St. Louis, lived for football and lived for Mizzou,” Dore says. Wilkerson also co-hosted the top-rated “Total Information” morning show on heritage St. Louis radio station KMOX (AM 1120) for years, with Bob Hardy and Wendy Wiese. Wilkerson is already in the Mizzou Media Hall of Fame. His photo is in the Memorial Stadium press box in Columbia. Dore says Wilkerson watched hours of film on opposing teams, saying that game preparation is what set Wilkerson apart. “He knew everybody, he knew the trainer for the other team if the trainer ran out onto the field. If it was the team doctor, he knew who the team doctor was. He knew everything,” says Dore. Dore says Wilkerson never criticized anyone during broadcasts. Dore tells Missourinet there was one game in which a Mizzou receiver dropped three passes against Kansas. He says Mizzou’s assistant coaches were in the next booth with the windows open when that happened, and that the coaches were furious with the player. Dore says some of their comments came over the airwaves. Despite that, Wilkerson did not criticize the player. “That’s the kind of guy he (Wilkerson) was. He called the game, but if you made a mistake or you tried and couldn’t do it or whatever, Billy wasn’t going to rip you. He just was not that type of guy,” Dore says. Before his death, Wilkerson was also honored by the FBI in Washington for his work with an initiative aimed at keeping St. Louis-area youth out of gangs and away from drugs. 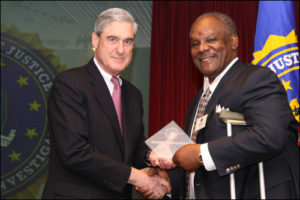 In 2010, Wilkerson traveled to Washington to accept the FBI Director’s Community Leadership Award from then-FBI Director Robert Mueller. The initiative, known as “Reach Out St. Louis”, was described by Mr. Mueller as a comprehensive program aimed at stemming the dropout rate at four St. Louis high schools. Wilkerson, who also called St. Louis Cardinal football and Blues hockey at times on KMOX, had numerous memorable calls at Mizzou, including the infamous 1990 “5th down game” against 12th ranked Colorado at Faurot Field. Mizzou led the game 21-17 heading into the fourth quarter, against a team that would be the co-national champions that year (with Georgia Tech). A touchdown pass from Kent Kiefer to wide receiver Damon Mays gave the Tigers a 31-27 lead with about two-and-a-half minutes to play in the game. Colorado marched down the field in their final possession, but during a timeout, the officiating chain crew did not flip the down marker to note it was third down. During that timeout, Wilkerson provided listeners with a snapshot of Mizzou football history, and how big an upset would be. “Third and goal at the Missouri one yard line. There have been times in the annals of Missouri Tiger football lore that someone has stepped forward and made a play. At Notre Dame (1978), it was Chris Garlich. At Ohio State (1976), it was Pete Woods. At USC (1976), it was Curtis Brown. At Alabama (1975), it was Keith Morrissey. Who among the 11 black-shirted Tigers today will make the play of the afternoon,?” Wilkerson asked on-air. The Buffaloes ended up getting a fifth down, and despite being hit by Tiger defender Harry Colon, the officials ruled that Colorado quarterback Charles Johnson scored a touchdown. Wilkerson’s call became an instant classic, and has been shown over the years on ESPN. “The snap, Johnson with the ball, no, no, no, no, they call a touchdown, they call a touchdown, they call a touchdown, oh I can’t believe this,” Wilkerson told listeners. Dore says Charles Johnson still hasn’t scored. In 1990, the Tiger Network did not have a sideline reporter, so Dore headed to the sideline late in the game to handle the postgame interview with then-Coach Bob Stull. Dore noticed that the officials did not flip the down marker, and says he was screaming at the officials, who told him to either leave or that he would be removed. 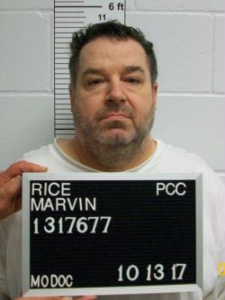 Dore says Bill Wilkerson told him off-air “Tell them to arrest you … that will be the greatest Missouri story ever!” Dore calls it classic radio, saying Wilkerson wanted to make that stop himself. Dore says Wilkerson would be thrilled with the St. Louis Media Hall of Fame induction. Tom Dore, who played for Norm Stewart at Mizzou from 1976 to 1980, also was a broadcaster with the NBA’s Chicago Bulls from 1991 to 2008. Dore was the back-up play-by-play man for one year and handled the television broadcasts for 17 years. The St. Louis Media Hall of Fame will be inducting 11 other honorees on Saturday. 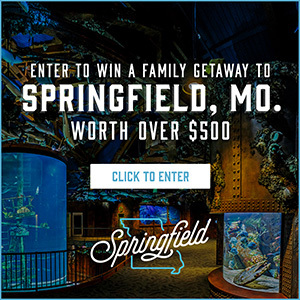 They include longtime KTVI general manager Spencer Koch, former KPLR President Ted Koplar, veteran Missouri Capitol reporter Jo Mannies and 12-time Emmy award winning meteorologist Dave Murray. Tickets to the Hall of Fame event are available for purchase. 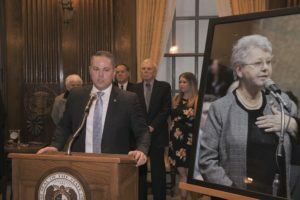 Legislation designating a section of highway in St. Louis County as the “Cloria Brown Memorial Highway” was signed into law by Missouri Governor Mike Parson Monday afternoon in Jefferson City. Lawmakers from both parties and both the House and Senate packed the governor’s Statehouse office for the bill signing ceremony. Several former lawmakers, including State Reps. Kathie Conway, R-St. Charles, and Diane Franklin, R-Camdenton, also attended. 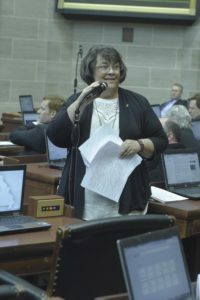 Former State Rep. Cloria Brown, R-Mehlville, served three Missouri House terms and died last March after battling cancer. Governor Parson says the bill signing is bigger than highway signs. “But really what is going to be important today is how she lived, what she accomplished, the goals she had in mind, with the representation she made of her family,” Parson says. Governor Parson describes Brown as a dedicated, compassionate public servant. House Speaker Elijah Haahr, R-Springfield, describes Brown as a special person who fought for the most vulnerable and exploited. “Not only did I get to serve with Cloria, I also had requested that she serve on my (human) trafficking task force and so I spent time traveling around the state with her and listening to the stories that the victims told us,” says Haahr. House sponsor State Rep. Patricia Pike, R-Adrian, says Brown’s legacy is her work against human trafficking. Lawmakers in both parties praised Brown during Monday’s bill signing ceremony. State Sen. Scott Sifton, D-Affton, who sponsored the Senate bill, praises Brown’s work ethic and her compassion, says Brown helped many Bosnian War refugees in south St. Louis County. “Just in the two years that I served with her in the House (2011 and 2012), I saw her time and again stand up and stick out her neck for her new American constituency in a way I don’t think everybody would have,” Sifton tells Capitol reporters. Sifton also says Brown worked hard at the Capitol and in her south St. Louis County district. Sifton says Brown attended every function for organizations such as the Affton and Lemay Chambers of Commerce, and the Lemay Child and Family Center. The law will take effect on August 28. 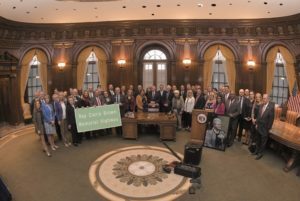 Under the legislation, private donations will fund the highway signs and crews from the Missouri Department of Transportation (MoDOT) will place them. Missouri’s governor is scheduled to sign legislation Monday afternoon in Jefferson City that honors a former state lawmaker who died about a year ago. 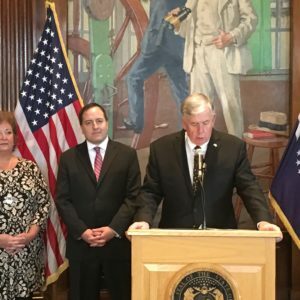 Legislation designating a section of highway in St. Louis County as the “Cloria Brown Memorial Highway” will be signed into law by Governor Mike Parson, who plans a 2:45 bill-signing ceremony at the Statehouse. 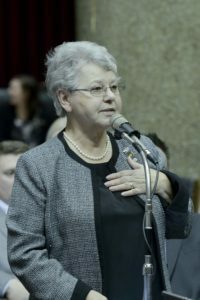 Representative Brown, R-Mehlville, served three House terms and died last March after battling cancer. The bill designates a section of heavily-traveled Lindbergh Boulevard from I-55 to Lin Ferry Drive as the Cloria Brown Memorial Highway. 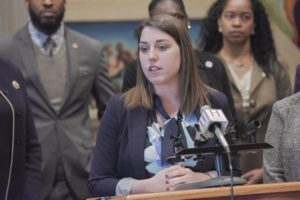 House sponsor State Rep. Patricia Pike, R-Adrian, praised Brown during a January briefing with Capitol reporters, calling her an amazing lawmaker. “She was a champion of women, (the) less fortunate, veterans, she was very passionate about the human trafficking issues of the state,” Pike said. Under the bill, private donations would pay for the highway signs, and crews from the Missouri Department of Transportation (MoDOT) would place them. 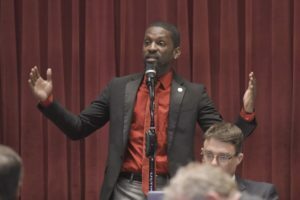 The bipartisan bill was approved by the Missouri House in January by a 150-0 vote, and the Missouri Senate voted 33-0 to approve the bill in February. Brown represented a swing district in south St. Louis County, a district that included Mehlville. Brown faced Democrat Vicki Englund in five elections. 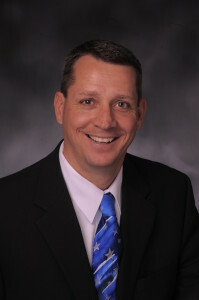 Englund won in 2008 and in 2012. Brown won in 2010, 2014 and in 2016.